I’m always looking for new running music. 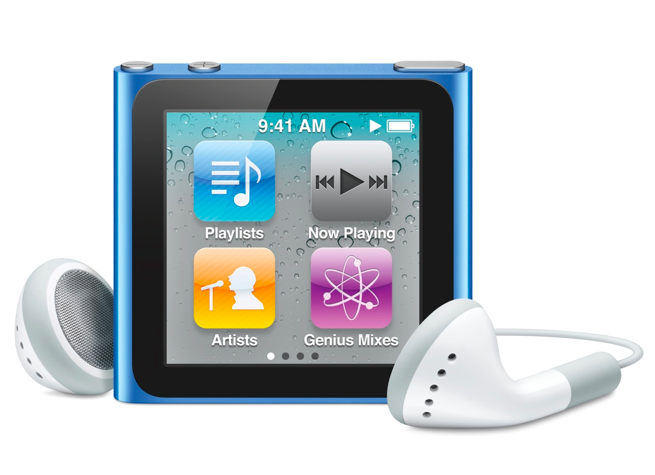 Sites like RockMyRun.com offer lots of play lists, but I always find it frustrating to sift through the thousands of songs and playlists to find those three or four new songs to put on my iPod for my next race. So, in case one of you lovely readers wants a new song or three, I recommend the following 21, which will be on my Houston Marathon playlist this Sunday. Some might fall under the “duh, I already have that” category, but maybe one or two might be new to you. And hopefully you find something you like! If you want to see and hear my entire playlist, you can see it on Spotify here: Houston Marathon. Well, I said I’d never run the Red Nose Run in Birmingham again because of how badly mis-managed the 5k was in 2010. But seeing as the race has a 10 mile distance and it’s exactly 8 days before the Houston Marathon, I decided to give it another try. I was pleasantly surprised this year. The trail was very well marked with orange spray paint and I don’t recall seeing a turn that didn’t have a police officer or volunteer directing runners. This was a fairly winding course through some residential areas, so the officers and volunteers were very useful. I think I’ll pull the RNR off of my “do not run again” list. The race directors stepped up their game and fixed their problems from last year. And the course (except for the hills, which I always hate) is pretty nice. So if I’m here next year, I’ll be running this race again! The hills were not fun. All in all, I think I did just okay at this race. Yes, I did set a new PR for myself, but I’m pretty sure I could have run it a little faster. 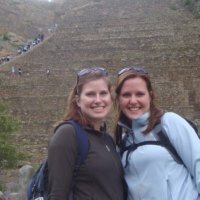 My excuse (maybe not good ones, but I do have excuses) is that I didn’t want to push myself too hard or injure myself before the Houston Marathon. Also, I walked the hills because hate hills. I blame hills for my peroneal tendonitis. Looking at my splits, I realize I didn’t exactly get the whole ‘negative splits’ thing for this race. I can tell I tried, in mile 2, to make up for my far-too-fast mile 1. Miles 7, 8 and 9 were far slower than 3, 4 and 5 — which is pretty much the opposite of what I went out to do in the first place. So I guess I’m giving myself an F for pacing, but a B+ over all. Oh well. Bring on Houston. I’m not sure how I missed it (I blame Thanksgiving & Christmas) but there are going to be some awesome goodies for the Houston Marathon. The medal is ridiculously cool. It might be just as cool as my Marine Corps Marathon medal. Either way, on it’s own it’s incentive enough for me to finish. 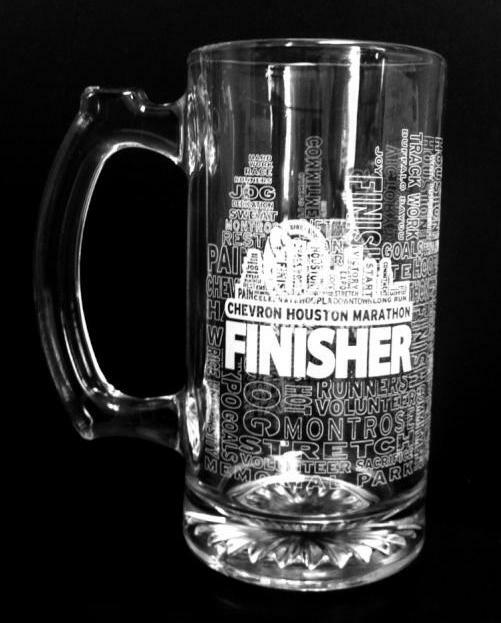 AND they we get a finisher mug! I plan on filling mine with beer. Repetitively. Is it just me, or do the prizes for finishing a marathon make it just that more fun? Is it January 15th yet!? I’m revved up to run! Courtesy of Monica Jean at Nerd Quirks over on Tumblr, this applies to both Laura and me. My MS Word dictionary and AutoCorrect are ridiculous. Are you nerdy too? 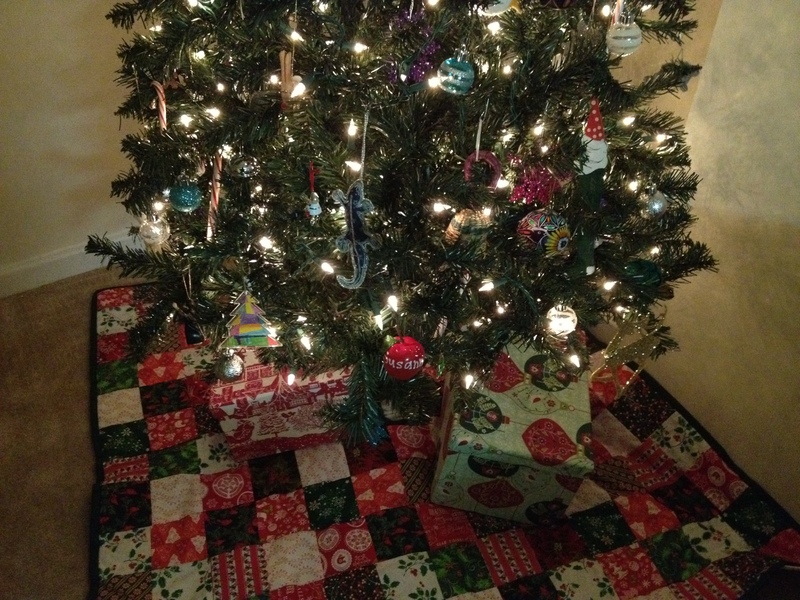 My handmade Christmas tree skirt. OR When did I get so domesticated? This year, my sister and I both gave in and got our own Christmas trees at our respective apartments. I helped her set hers up and decorate it when I was there just before the Thanksgiving holiday. So here are a few photos of my process and a picture of the final result. It was really not that difficult to make, and I completed the thing in maybe ~20 hours of work spread over a week. I think it turned out pretty well, and I guess so did my sister (she said she loved it) and my mother (she wants her own, but Florida Gators themed because she has a separate, smaller Florida Gator Christmas tree and it’s difficult to find a cute blue tree skirt). I lucked out and found all of the holiday patterned fabrics on the 50% off rack at my local fabric store. So I grabbed a few and brought them home and cut them all into 4in squares (well, 4.5in squares, since the stencil I was using allowed a 1/4in seam). If you’re going to make this skirt too, I highly suggest spreading this out over a few nights and watching a movie while you do it. It’s tedious and takes forever. After looking at all of the squares together in a group, I decided I didn’t think a few of them went with the others, so I just excluded them. Then, I ironed. I ironed each of those little damn squares. 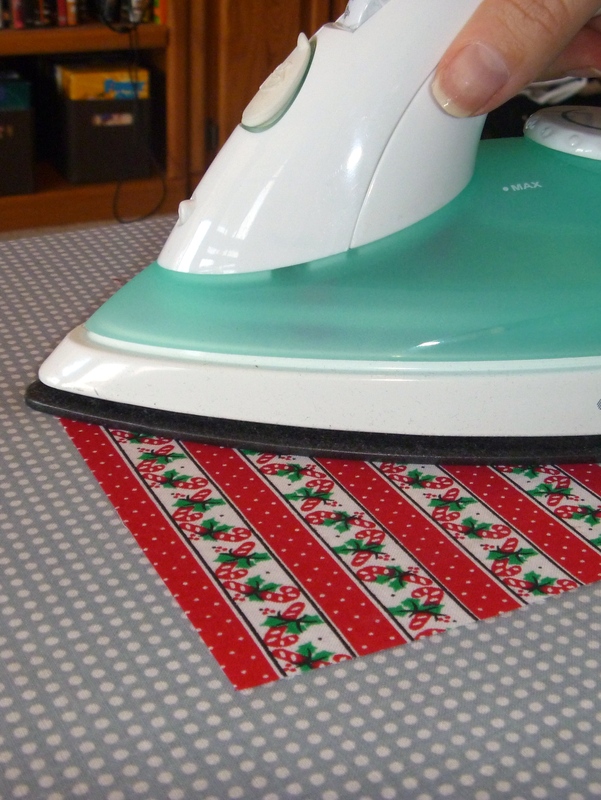 This was highly annoying and far more ironing than I’ll ever enjoy doing. My clothing didn’t end up getting ironed for a few weeks because I was so tired of ironing after this project (I stuck stuff in the dryer for a few minutes to avoid being wrinkly). 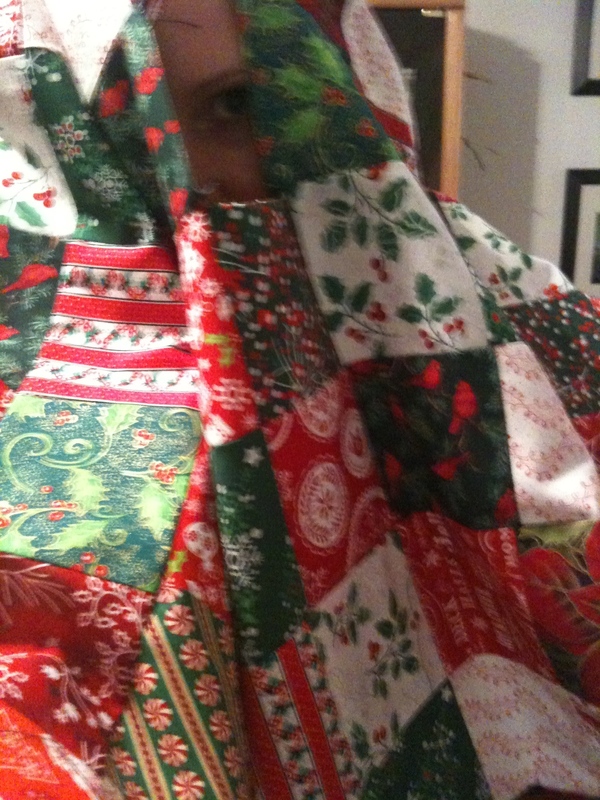 There was far more ironing involved in making this tree skirt than I am comfortable with. 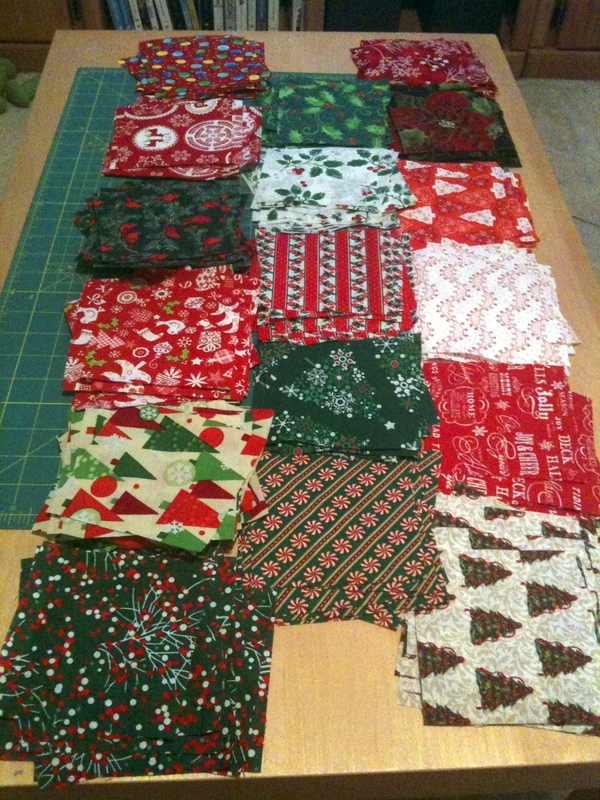 So after all of my little squares were cut out and ironed, I began to lay out my tree skirt. I wanted to make sure that no white square was next to a white square, or green next to green or red next to red. It took a little bit of finagling but I think I got it spread out well. 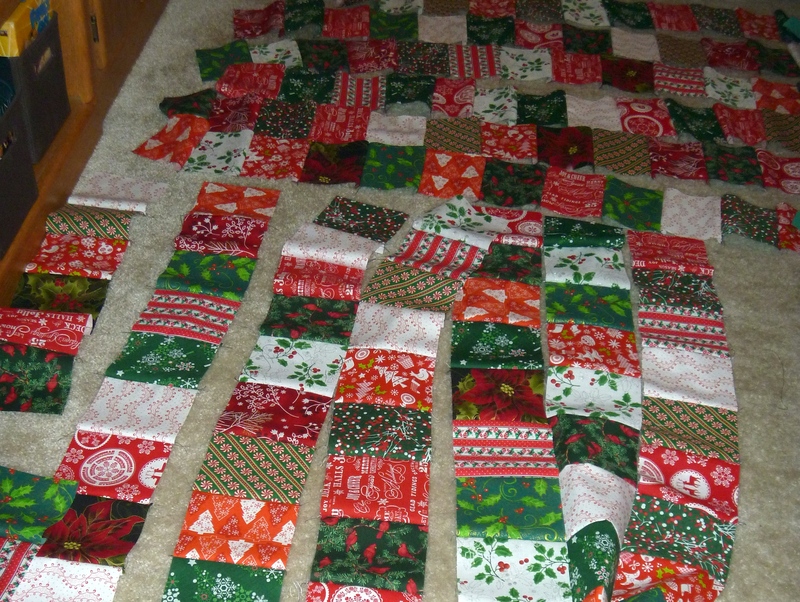 All the squares, laid out and ready to be sewn together! 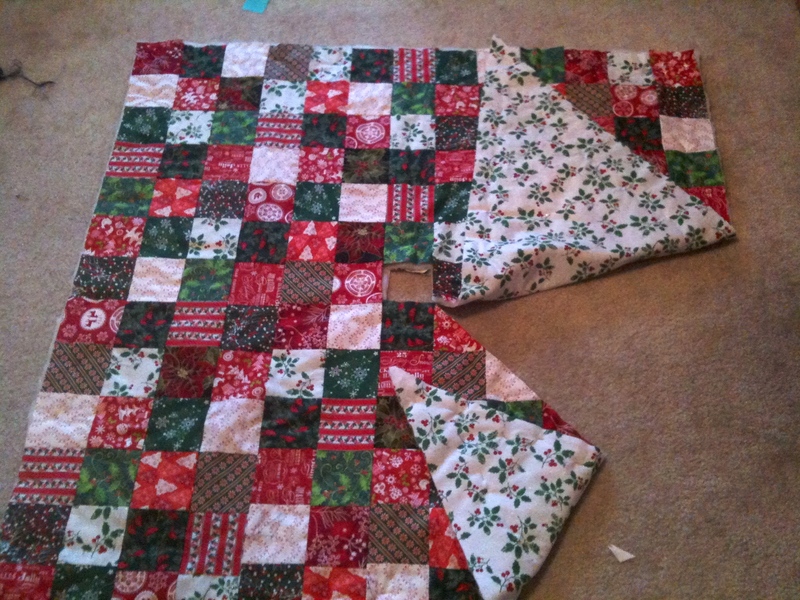 …and then I sewed the strips into a big square. There was even more ironing after each of these steps to make sure the seams laid flat. I’ll be happy if I never have to iron again. This night I was a little slap happy. 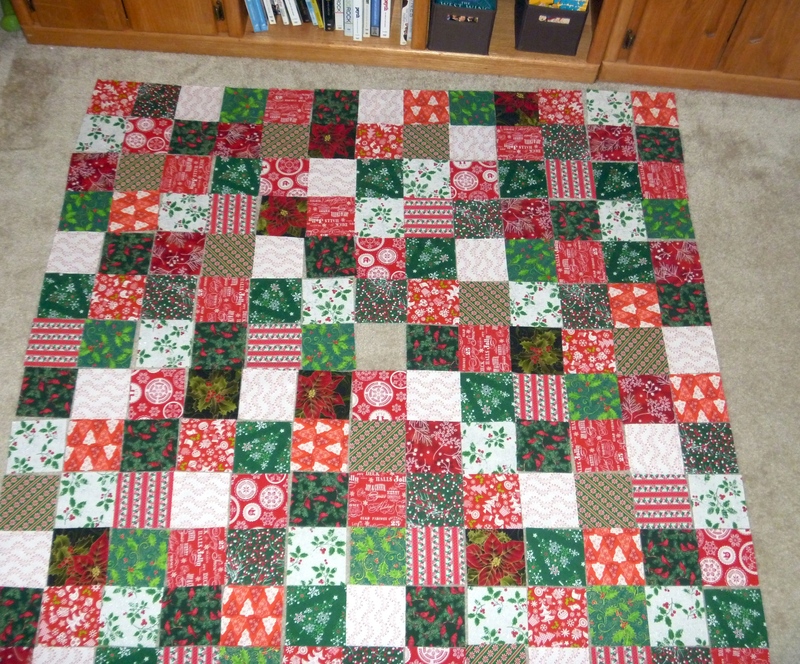 I’d decided I wanted to finish the damn thing already and ended up watching White Christmas on AMC three times in a row (hey, they showed it three times in a row), mostly because I liked the Christmas-y theme but also because I was too lazy to search for the remote control in my sewing mess. For those of you following my sister and I on Twitter, this was the night of our arguing about which White Christmas character each of us was, and who would win if we had a feather-fan fight. My sister and I are usually this goofy, but this night I was the epitome of ridiculous. Think I could call this photo "The Ghost of Future Christmas Presents"? 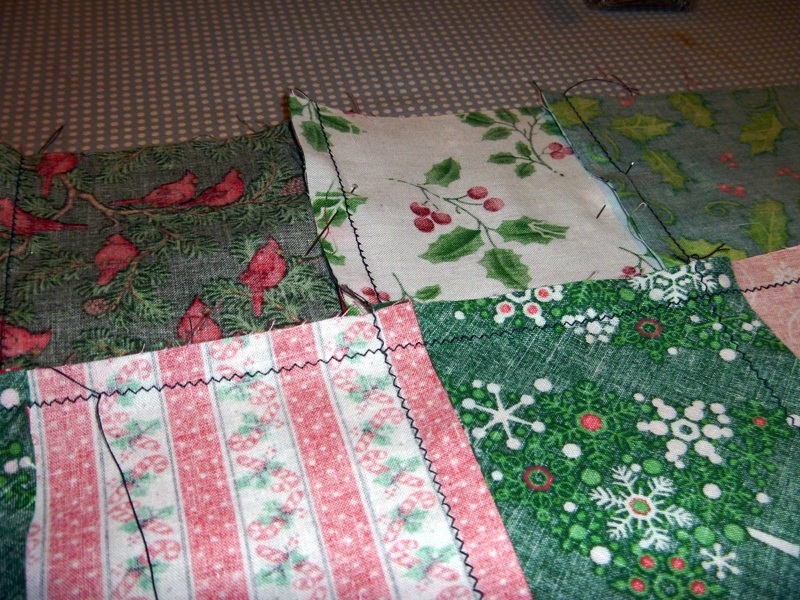 After I calmed down a little, I layered the quilt layer, the batting sheet, and the backing sheet together. Then I put a bunch of safety pins around the edges of the quilt layer, cut off the extra backing and batting around the edges. The next step was to cut the slit to allow for the skirt to be placed around the tree. I decided to cut diagonally from a corner, because my backing fabric was two triangles sewn together along the other diagonal. Cutting the seam here allows my sister to use the backing sheet as her tree skirt without having a seam right out of the front of the skirt. Then all that was left was to sew on the binding, which I (stupidly?) decided to machine stitch on to the front, and then fold over and hand stitch on the back. I watched two movies while hand-sewing the binding to the back. 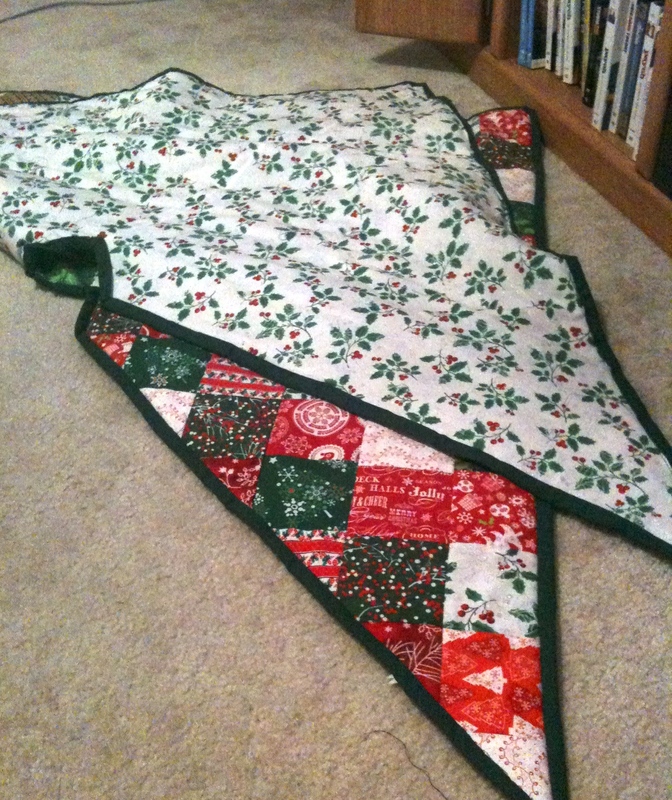 When I make my mother’s tree skirt, I’m going to allow for another entire week to hand-stitch on the binding. I didn’t do the greatest job stitching on my sister’s skirt because I was rushed and I’ll probably have to re-do it in a few years. Looks pretty good if I do say so myself! 2012 in 2012 Update – Motivation & So far, so good. Ok, yes. It’s only January 2. But so far, my 2012k in 2012 goal is off to a running start (pun intended). I would run the Houston Marathon exactly 2 weeks later and I’d set myself a new year’s resolution to run 2012 km (1,250 mi) in 2012, so I hit my regular running path. So on the morning(ish) of January 1, I got out of bed at around 11am in a rotten, pessimistic mood, dreading the new year. 12 miles later I was happy and in an optimistic mood. That’s the great thing about running. Darth Vader really *IS* a horrible person after all. While home on Christmas vacation, I dug through some old boxes and found my high school year books. 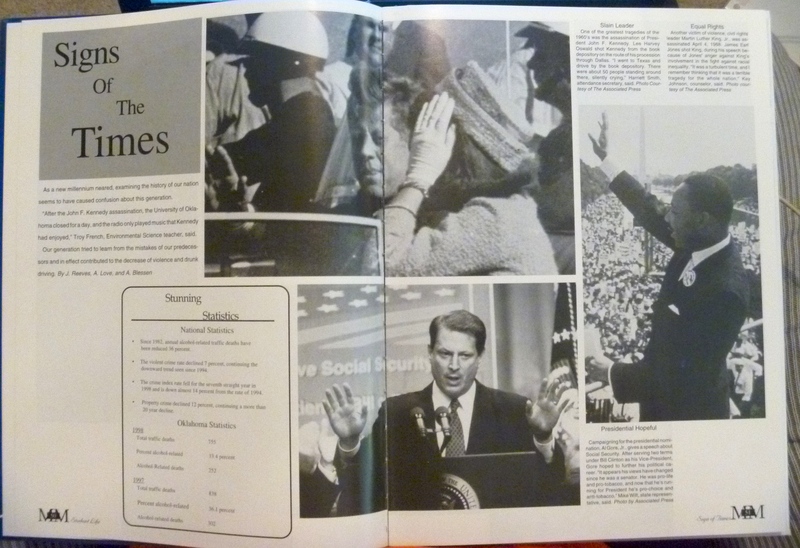 Like probably most year books from the year 2000, mine had a “Millenium in Review” section. 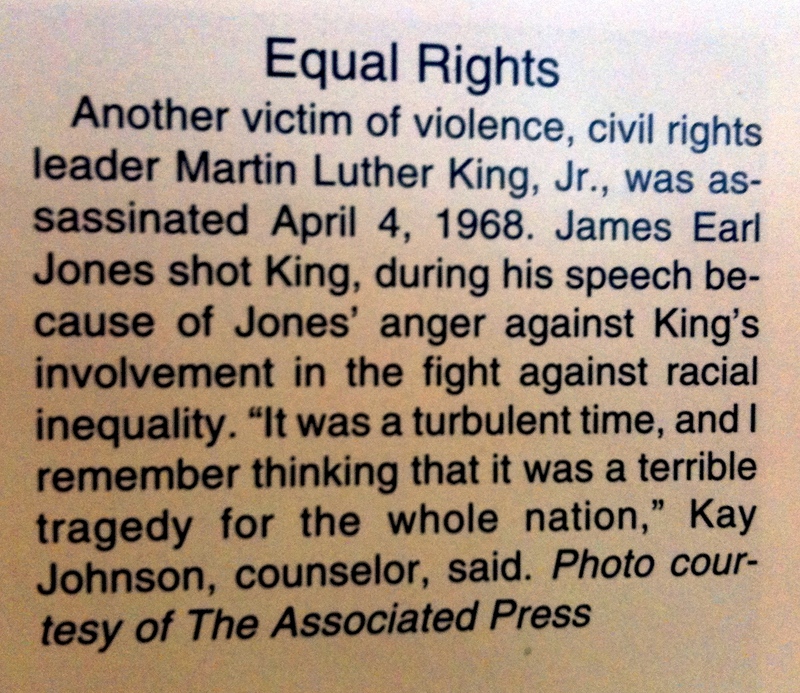 However, unlike most year books from the year 2000, apparently mine did not have an editor that passed middle school history. So at least they got the photo right. The text below is from the upper right corner. Well done, idiots. Well done.